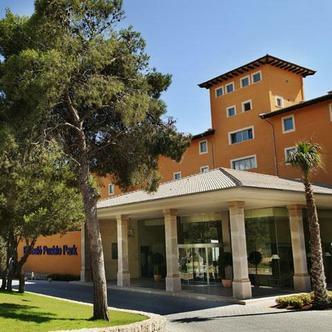 Situated in a pleasant area of Platja De Palma, just minutes from the airport and a short walk from the beach, the Barcelo Pueblo Park offers the ideal facilities for your well deserved leisure trips. Surrounded by Meditterranean pine trees, the appeal is evident to both young and old.The hotel was totally refurbished in 2004 in the typical Majorcan style. Its 276 fully equipped rooms are designed to satisfy all our guests expectations and each one provides all the modern facilities and amenities. The Barcelo Pueblo Park provides escorted adventure and expedition for all generations. The hotel also has beautiful landscaped gardens and other leisure amenities.The hotel restaurant caters typical and international dishes, which will make the most demanding guests palates happy.In addition, the Barcelo Pueblo Park is the best choice for resting, having fun in the nearby discos, water sports, visiting amazing monuments and towns or working in a unique environment.